Last Wednesday, I registered for the Main Ticket sale for Burning Man 2016. As I hit the “Submit” button, I reflected on my experience last year through Carnival of Mirrors, which heralded my journey with cancer. Carnival of Mirrors was expedition number three for me to Black Rock City. The previous two years had proved to be so profound that I was hooked. Going to Cargo Cult in 2013 was the culmination of spiritual work I had begun in 2012, and luckily, the ticket materialized fairly easily. Caravansary in 2014 was another matter: both the Main Sale and STEP proved fruitless. And while a ticket did eventually appear, I had decided to appeal to the Universe for additional help by volunteering as a Temple Guardian. Perhaps that appeal had an effect: I had an incredible time and my blog about it can be found here. You may be able to tell by now that Burning Man has taken on a particular spiritual significance for me. So when the cancer diagnosis came down, I took it seriously. The tenor of the entire trip to BRC changed. I reached out to my Temple Guardian family to help me keep up the energy to not only attend, but to continue to make a difference. Even if it would be my last time. I found myself struggling with some of the very issues that make the Temple so special: a place to come to terms with Death. Only this time, instead of for loved ones who had passed over during the year, I was contemplating my own. I certainly wasn’t ready to go, but I had quite a number of hurdles to overcome if I was to survive. For me, Burning Man represented a gathering of spiritual and energetic resources to stay grounded. Literally. By the time I arrived on the Playa, the pain in my mouth was quite severe. It affected my ability to eat—increasingly, I could only do softer foods—and drink. My camelback became useless as I could no longer draw water through the mouthpiece, so water intake became even more difficult in the harsh environment. I had painkillers, which helped, but whereas I started off the week with one per day, by Wednesday I was forced to take up to three per day. My supply ran out before the week did. One of my Temple Guardian buddies came to the rescue with additional high-dose ibuprofen. They weren’t the prescription pills I had originally brought but they were a life-saver. If you have ever dealt with severe pain, you know how quickly it saps your daily energy. I ran out of steam early each night; no all night dance parties for me this time around. However, I had made a commitment to the Guardians. As much as I was able, I curtailed my personal activities so that I could fulfill my Temple shifts, some of which were from three to six in the morning. I also had camp shifts to do, though these mainly consisted of helping in the kitchen for breakfast. Coffee helped! Of course, the other piece that kept me going was the incredible amount of support I received while on Playa. In addition to the Guardians, wonderful friends were constantly checking up on me to make sure I was okay. Craigster, Randy, Greywolf, and Deb were my angels at Camp. Junior and Jim were my saviors by offering me a place to stay when my tent proved completely unsuitable for the Playa. But it was Beverley who was my spiritual haven. Even though new to Burning Man—what fun it was to show the newbie around—she was the constant companion, the shoulder to cry on. She listened to me when I wailed about the unfairness of the whole cancer experience. She consoled me when I contemplated what it would mean if I died, leaving my new husband bereft. These are the people, members of my extended spiritual family, who made Burning Man such an exquisite time of reflection, and even peace. Maybe it wasn’t my time after all. Maybe it was just sheer stubbornness on my part, but I made it. I survived not one but two surgeries to remove cancer from my tongue and on both sides of my throat. I endured six weeks of radiation and three rounds of chemotherapy. Seven months after Carnival of Mirrors, I am still on leave from work, recuperating from all the treatments. My speech is still impaired though improving and I am relearning how to eat again. In spite of all that, yes, I registered for Burning Man again today, with full intentions to attend Davinci’s Workshop. 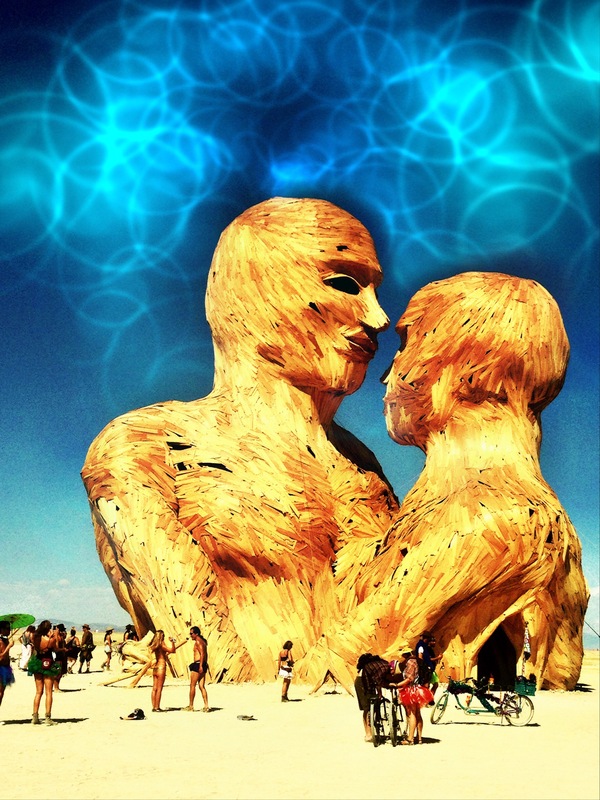 Burning Man is, and always has been, much more than a huge party. It is a vision of how I want to live my life, full of passion and creativity. It has played an integral part in one of the toughest challenges of my life to date: cancer. I owe, and acknowledge, an incredible debt of gratitude to the brave souls who started out all those years ago on the beach in San Francisco. You saved my life. This year I will be of greater service to the community if I can just get a ticket. It’s true. I hadn’t seriously considered volunteering until mid-summer, when a ticket to Burning Man didn’t materialize during the main sale. The OMG sale would eventually prove to be just as fruitless, but I didn’t know that at the time. Meditating on the situation, I felt I was going to have to exert some serious Mojo in order to attend; the Man was upping the ante. However, in looking back, I couldn’t have imagined what serious magic I was about to invoke. In my spiritual tradition, when doing magic to obtain a goal, part of the mindset required for fruition is to proceed as though the goal has already been attained. To that end, my partner and I began all of our normal preparations anyway. However, I decided to put a little something additional on the line: volunteer. Of course, looking over the list of possible options, Temple Guardian immediately stuck out for me, as I suspect it did for many of us that first time. In the default world, I am also a healer and spirit worker; guardianship of sacred space is what I do. Having a profound experience at the Temple of Wholyness in 2013 also played a part in my decision making process. Indeed, my only regret from last year was in not staying for the Temple Burn. Volunteering as a Temple Guardian took on a special significance though, as I pondered what it would be like to provide that kind of service for a community of 65,000+! Preserve the safety of the Temple and the participants who visit it. True to form for Burning Man, this year’s Temple experience went far deeper than I ever dreamed. Friday night and Saturday morning were relatively quiet as far as the shifts themselves went. And although I was prepared for Sunday to be a completely different experience, how could I know it would touch, hurt and comfort me as deeply as it would? As many would be that Sunday morning, I too was quite surprised when checking in for my shift to learn that the Temple was already closed. In talking to folks in the courtyard, and later at the gate, I was confronted with varying degrees of disappointment and sadness in hearing the news. A small few of the extremely devastated would be invited in last-minute by none other than David himself, the man who was responsible for this year’s Temple design. One couple was not. She had lost her baby earlier in the year. She didn’t say how, nor did her husband go into a detailed story about why they hadn’t yet made time for the Temple. I can imagine how hard it must have been to even think about it, knowing that the journey must be made anyway. He was stricken, looking past me into the Temple itself. However, she looked directly at me, hearing the words that I had to say, knowing that it was now too late. I met her gaze and offered her the only thing I had in my power to offer her, my open arms. She hesitated ever so slightly, but as she came in for an embrace, I took all of the hours I had spent wandering the courtyard and inside the Temple itself, all of the tears I had personally shed for my own loved ones, all of the memories of witnessing our community members who were meditating/laughing/tearful, all of the visions of the heart-wrenching tributes left behind, and offered them to her for her lost child. He came over too, and together, we sobbed for all of the things that couldn’t be. We stood in the fire together, at the Gate of the Temple. Later that evening, taking the collective gasp along with thousands of others at the sight of the majestic structure spiraling down to its end, my inner walls would finally come crashing down at the gentle touch of a baby’s breath.